Image Courtesy of C-K Autumn Fest, Inc. Many people drive miles to see elaborate Christmas displays, but Kenova West Virginia lights up the night for another holiday celebration—Halloween. 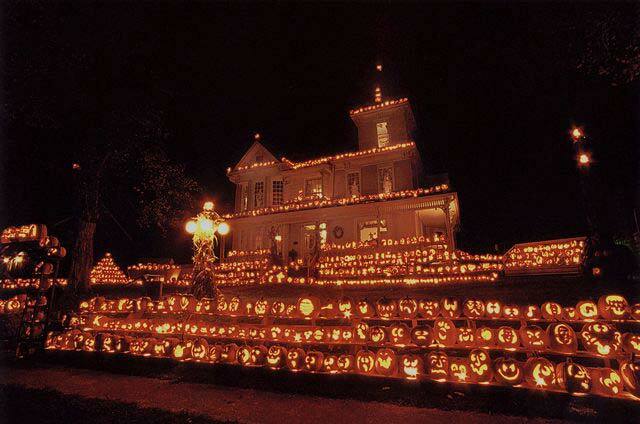 In 1978, the Pumpkin House tradition began with only 5 pumpkins carved for a Halloween display. 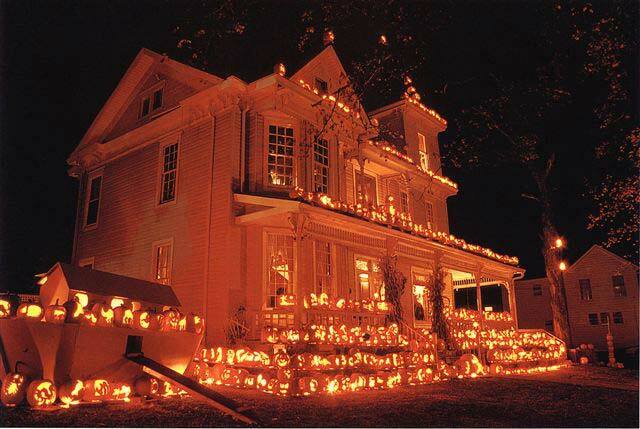 Since then, the number of hand-carved pumpkins has grown to 3,000. At night, the lights can be seen from across the river in Ohio. Every Halloween season, the house at 748 Beech Street in Kenova, West Virginia is transformed into the Great Pumpkin House. The owner, Ric Griffith and hundreds of other volunteers carve thousands of pumpkins for display at his home every Halloween. This illuminated wonder, which welcomes nearly 30,000 visitors each year, takes center stage at a Victorian house, dating back to 1891, at 748 Beech Street. Formerly, the house was notable as a stopping place for President Grover Cleveland. Now, it’s famous the number of glowing jack-o’-lanterns. Categories: Family Travel, West Virginia | Tags: Carved Pumpkins, Family Travel, Halloween, Kenova, Kids, Mid Atlantic Region, Mid Atlantic States, Mid Atlantic Travel, Pumpkin House, Pumpkins, West Virginia | Permalink. West Virginia Penitentiary has added a thrilling new attraction to the fall line-up of fun with their Zombie Paintball. Zombies are loose on the South Yard, and it’s up to you to save the town at the West Virginia Penitentiary in Moundsville, WV. Grab one of their stationary paintball guns and do your best with live, unarmed zombie targets. From 7:00 p.m. until closing, zombies will be waiting for you. Zombie Paintball runs concurrently with the Dungeon of Horrors and the North Walk. The Dungeon of Horrors is filled with new and thrilling experiences this year. Over 10,000 people each year are introduced to one of the scariest places behind bars. In The Dungeon of Horrors you can experience the fright of being locked in a cell, the fear of being lost in a maze, and the terror of an eerie walk through the dungeon of horrors. Will you manage to keep up with your group and not get separated? Do you have what it takes to make it through? Don’t worry, our actors will be there to help you along. (Snicker.) Warnings and rules apply; take them seriously. Especially the one about live bats. 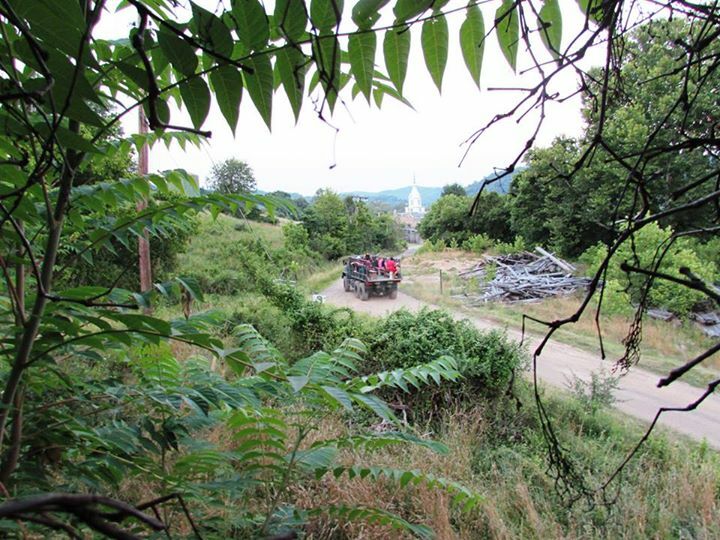 The North Walk will take you through the oldest part of the former West Virginia Penitentiary. It is also known as the area with the most paranormal activity, a place where murders, violence and brutality were common everyday occurrences. 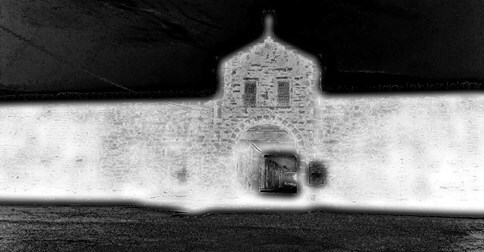 This was where the most dangerous inmates were housed, the maximum security area, North Hall; the inmates called it – The Alamo. You will enter this part of the prison through the “Administration Building” and the “wheel” – these areas have been closed to the public for years and only opened for the Haunted House season. The North Walk is not an attraction, but a flashlight tour of an area that was once considered one of the bloodiest institutions in the nation. There are no actors on the North Walk. It’s just your group, your tour guide, a flashlight, and a few tales from the past. The areas that you will visit include: North Hall, the Boiler Room, The Infirmary, and The Psych Ward. 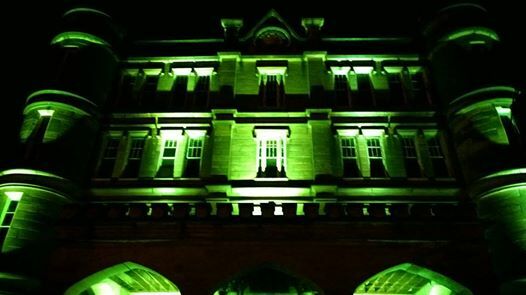 If these events sound a little too intense for the younger members of your family, the WV Penitentiary has a Kid’s Night on Monday, October 27th, 2014 from 6:00 p.m. – 8:00 p.m. Designed for children ages 1 – 6, the trick-or-treat style event, allows children to spend time gathering goodies from several tables, playing games, taking pictures on a fire truck, face painting, and having fun. Family Night, October 28th, 2014 from 6:00 p.m. – 8:00 p.m. is designed for Kids ages 7-12. The “Lil Dungeon of Horrors” is a scaled-down version of the haunted house specifically designed for younger children that might not be ready for the “full” Dungeon. They do not recommend anyone under the age of 13 to attend the regular season Dungeon of Horrors. The actors will NOT be in full costume and will respect smaller haunted house attendees. Use the phrase “Monster Be Good”, if it gets too scary! Categories: Children's Travel, Family Travel, West Virginia | Tags: "Lil Dungeon of Horrors", Dungeon of Horrors, Family Travel, Halloween, Haunted House, Haunted Prison, Kids, Mid Atlantic Region, Mid Atlantic States, Mid Atlantic Travel, Moundsville, North Walk, West Virginia, West Virginia Penitentiary, Zombie Paint Ball, zombie targets, Zombies | Permalink. The countdown has started to the New River Gorge Bridge Day on Saturday, October 18, 2014. On that day, BASE jumpers leap 800+ feet into the New River Gorge below, or are launched by the Human Catapult. Rappelling, skydiving, and more adventure abound. You ready? BASE stands for Building, Antenna, Span, and Earth. BASE jumpers leap from any and all of these four fixed objects with parachutes designed specifically for rapid deployment. 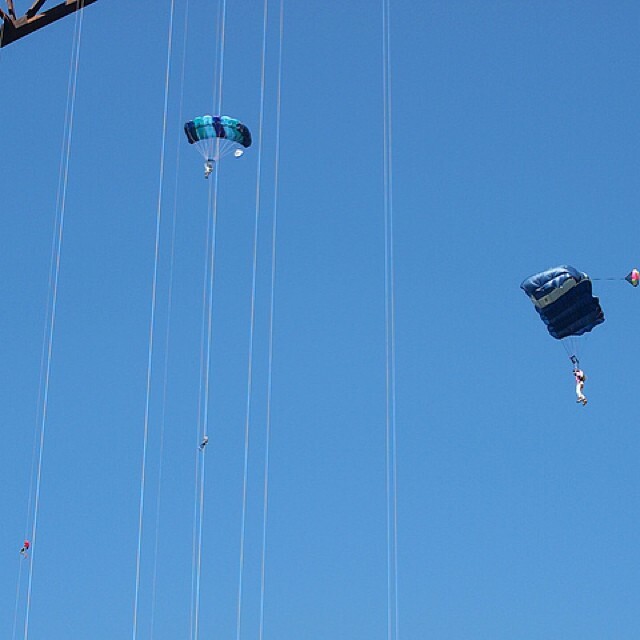 Known around the world as the most extreme of extreme sports, BASE jumpers look forward to Bridge Day ® every year. The New River Gorge Bridge saw its first BASE jumpers in 1979, just 2 years after the bridge was completed and opened to the public. As more and more people entered the sport, the tradition of coming to West Virginia for Bridge Day has grown- more than 800 jumps were made last year. The vast majority of people (more than 80,000 expected) visit to Bridge Day to watch. All of the jumpers are registered, and can make as many jumps as they are able to within a six hour window. 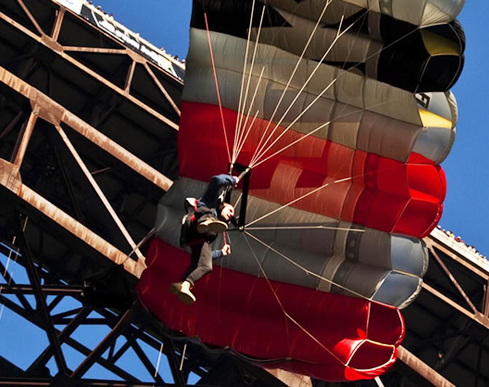 This year the folks at Bridge Day are once again teaming up with Vertical Visions and Subaru to offer one lucky winner the chance to tandem BASE jump off of the New River Gorge Bridge. Think it should be you? Then create a video that shows the world why you should be chosen to jump. A charity of your choice will also receive a $1,000 donation, courtesy of Subaru. So be sure to also tell everyone all about your charity and why you’re willing to jump off a Bridge for it. Video submissions will be accepted on Facebook beginning Friday, August 15, 2014. All submissions must be uploaded by 11:59 PM on Tuesday, September 2. Voting will begin on Wednesday, September 3 and end on Wednesday September 10 at 11:59 PM. Categories: Adventure Travel, Contests, Outdoor Adventures, Sports, West Virginia | Tags: Adventure Travel, BASE Jump Contest, BASE jumpers, Bridge Day, Bridge Day Contest, extreme sports, Free BASE Jump, Human Catapult, Mid Atlantic Region, Mid Atlantic States, Mid Atlantic Travel, New River Gorge Bridge, New River Gorge Bridge Day, Rappelling, skydiving, Sports, Tandem BASE Jump Contest, West Virginia | Permalink. More dates added for fall splatter fun! Zombies have risen from the graveyards back on the farm, help contain the infestation. The truck leaves every 30 minutes. Starts at 7:00 pm last ride is at 11:30 pm. No equipment needed. You do the shooting. Tickets can be purchased Friday and Saturday Evening either at the ticket booth or over the phone if you need a certain time. BE AWARE there are only 18 tickets every 30 minutes and is expected to sell out fast. ALL ZOMBIE TICKETS ARE FIRST COME FIRST SERVE TODAY!!! Don’t worry about getting your timed ticket online today, just come to the main entrance and choose your time to battle! No equipment or experience necessary and you will not be shot! I had to back-track a bit, to find out that the Trans-Allegheny Lunatic Asylum in Weston, West Virginia is holding a ZOMBIE PAINT BALL event today, Saturday, August 2, 2014 from 1:00 pm until 5:00 pm. Truck leaves every 30 minutes. 100 paint balls included. Reloads available for $5.00. http://www.talawv.com. Get out there and do your best zombie shuffle. Update: They are running the ZOMBIE PAINT BALL in the daytime, every Saturday until the last weekend of September. Volunteers still needed to be zombies. Tickets until October are $15.00 per person. Categories: Adventure Travel, Outdoor Adventures, Sports, West Virginia | Tags: Adventure Travel, Family Travel, Mid Atlantic Region, Mid Atlantic States, Mid Atlantic Travel, Paint Ball, Trans-Allegheny Lunatic Asylum, Volunteer Zombies, West Virginia, Weston, Zombie Paint Ball, Zombies | Permalink. 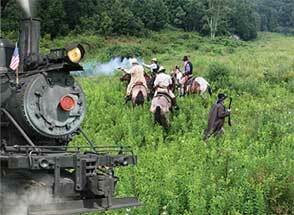 Western characters make surprise appearances during Durbin & Greenbrier Valley RR Wild West Weekend. Their steam driven trains are tempting targets of robbers, but never fear, there hold-up is all in fun. Durbin & Greenbrier Valley RR operate beautifully refurbished and historic locomotives that depart from both Elkins and Durbin depots, which allow travelers the opportunity to enjoy scenic West Virginia from an entirely new perspective — aboard any one of their four unique trains. From April to December, The Durbin & Greenbrier Valley Railroad offers Five Mountain Rail Adventures, each with its own unique journey, into some of the best scenery this side of the Rockies. Their unique collection of trains roll through a potpourri of West Virginia mountain wilderness areas. Choose to chug alongside a clean, mountain river, and take in the sights of rolling meadows of wildflowers and the sounds of a genuine steam locomotive. Climb to over 4,000 feet in elevation in a powerful diesel, burrow under the mighty Cheat Mountain and negotiate the two sharpest mainline railroad curves in the U.S. Categories: Family Travel, West Virginia | Tags: Durbin, Durbin & Greenbrier Valley RR, Durbin & Greenbrier Valley RR Wild West Weekend, Elkins, Hisoric Rairoad Cars, Historic Railroads, Journeys by Train, Kids, Mid Atlantic Region, Mid Atlantic States, Mid Atlantic Travel, Railroads, Steam Engine, Train Hold-up, Train Trips, West Virginia, West Virginia Railroads, West Virginia Scenic Journeys, Wild West Weekend | Permalink. It’s not too late to get your duct tape on, express you creativity and join the Duct Tape & Cardboard Sled Race at Blackwater Falls, W.Va., this weekend. Blackwater Falls State Park’s sled run will host the annual Duct Tape & Cardboard Sled Race Feb. 22. Blackwater Falls State Park’s sled run will host the annual Duct Tape & Cardboard Sled Race Feb. 22. For the second year, winter enthusiasts/duct tape engineers are invited to design and construct a person-powered, corrugated cardboard sled that can withstand the descent on the Blackwater Falls State Park Sled Run. “In an era of high-tech and prefab equipment, we still rely on ingenuity, creativity, and the basic handyman tools duct tape and cardboard for some real winter fun,” said Blackwater Falls State Park Activities Coordinator Paulita Cousin. Registration begins at 10 a.m. Saturday, Feb. 22 with the race starting at 11 a.m. The registration fee is $1.00. Three awards will be presented: “Tip Top” for most visually appealing sled, “Spirit” for the team demonstrating the most “for the fun of it” spirit, and “Speed” based on best downhill time. “The sleds can only be constructed of corrugated cardboard and duct tape. No plastics or other materials are allowed,” said Cousin, who will inspect the sleds prior to the race. All sleds must be free of safety hazards including sharp edges and pointy objects. To qualify as a finisher, participants must be on or in the sled when crossing the finish line. One of the rules is to maintain control of the Duct Tape and Cardboard contraption. To pre-register, a race form is posted at the park website at http://www.BlackwaterFalls.com. The race is open to children and adults. It will be held at the Blackwater Falls Sled Run, which is covered with natural snow. A conveyor system at the run makes access to the top of the mountain easier. 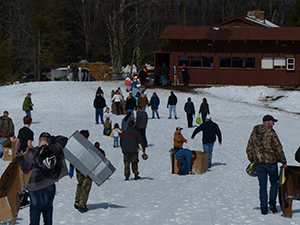 Additional information about the Duct Tape and Cardboard Sled Race is online at http://www.BlackwaterFalls.com under Events/Deals, or call 304-259-5216 or email blackwaterfallssp@wv.gov. Categories: Outdoor Adventures, Sports, West Virginia | Tags: Adventure Travel, duct tape, duct tape sports, Mid Atlantic Travel, Outdoor Adventures, sledding, Sports, West Virginia, West Virginia Travel | Permalink.